4 Conclusion: Hanging Egg Chairs, Cheap! There’s nothing more relaxing than sitting out on the patio on a warm sunny day, gently swinging in the snuggly realms of a hanging egg chair. As elegant and classy as these chairs look, believe it or not, some of them don’t cost a fortune. And with just a small investment you could soon be chilling out on one yourself. The best cheap hanging egg chair we’ve come across lately is a fine example on offer from Art to Real. 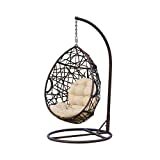 Not only is it a nice looking hanging swing chair, but the large cushion area makes it quite comfortable to sit in. 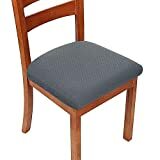 For a complete review of the Art to Real chair, see our Product Reviews section below. If for whatever reason, you decide the Art to Real Hanging Egg Chair isn’t for you, there’s always the Island Bay Espresso Resin Wicker model to consider. It’s of a slightly more contemporary look than its competitor and is just as solid and well made. The only area it falls short in comparison to the Art to Real model is it’s slightly less cushioned. However, it’s still plenty nice enough to sink into and get forty winks when you need to. In this section, we’ll look closely at five different hanging egg chairs on the cheaper end of the spectrum. If you decide you want to move up the scale in price, be sure to check out our article on the more high end hanging egg chairs. If you’re looking for something for the kids, consider a hanging pod chair as well! Art to Real has a hit on its hands with its cool, stylish, inexpensive hanging egg chair. Featuring a large, husband-like cushion design, and a simple gondola-like frame, this chair is striking, super comfortable, and really cool! Available in two fabric color options, and including the C-stand, this egg chair comes fully equipped to make you relax for years to come. If you’re looking for a fresh and funky alternative to the same, boring patio furniture that you see each and every year, be sure to check out this fabulous hanging egg chair on offer from Art to Real. Available in a brilliant blue or a vibrant orange option, this chair will look great just about anywhere. It has a powder-coated aluminum frame, meaning it’s both durable and lightweight, and should not rust even when left outside. On top of the frame is a set of large, 3.15” thick cushions to provide you with all the comfort you need. That said, be sure to store these inside or in a deck box to keep them looking as good as possible! There’s not much needed in terms of assembly, and everything you need to put it together is included in the package. With clear instructions and a few spare minutes, in no time at all, you’ll be swinging to your heart’s content on this beautiful chair. When it comes to cheap hanging egg chairs, The Art to Real hanging egg chair is a gem. The frame and egg design are pretty minimal, which some may love and some may not, but it is a positive for us. There’s very little that can go wrong, as well, which we really like. Either the blue or the orange really stand out and being UV resistant they don’t fade quickly either. The cushions are also very spongy and some of the comfiest around while the aluminum frame seems nice and sturdy. All in all, it’s an excellent choice in terms of cheap hanging egg chairs and is the ideal accessory to add to your backyard this summer. The Christopher Knight Brown Wicker Tear Drop hanging chair is a striking chair with a fractured, modern look that we love. The frame is made of iron, which is wrapped in PE-wicker for outdoor strength and stability. The cushion is smaller than what is found on the Art to Real, but the overall aesthetic is striking and cool. If you’re looking for a cheap hanging egg chair that has more of a contemporary feel to it, then be sure to check out this beautiful wicker model on offer from Christopher Knight. Not only does this chair look good, but it also provides you with somewhere fun and comfortable to relax on a warm, sunny day. The frame is made from heavy-duty iron, and the chair itself is made from a beautiful brown meshed wicker that’s both UV and weather resistant. In terms of assembly, it’s not the easiest if chairs to assemble, but everything you need comes included and with a little perseverance you should have it together in under 20 minutes. Unfortunately, there are a couple of design issues here that we should bring up. Some buyers have found that the attachment from the C frame to the chair frame tends to fail after a short time, rendering the chair dangerous to sit in. Additionally, the base of the frame sticks out beyond the end of the chair, and when people (especially kids) are getting off the chair, it’s easy to land on the frame and fall over, instead of landing on flat ground. The style of the Christopher Knight Home Egg chair is a good deal more compelling to us, compared to the Art to Real chair, but the design issues we mentioned above give us pause, and make it hard to recommend at the moment. It also has quite a low weight capacity and hangs a good bit lower compared to many others out there. Unless you love the style and are very careful, consider a few other options. Island Bay’s Boho Chic Hanging Egg Chair has a modern, but resolutely patterned wicker weave that looks great, and makes for a beautiful outdoor chair. This egg chair comes with a wide lower cushion that does not have any back cushion but is still quite comfortable and beautiful. The wide round shape of the egg makes it a simple, classic style, and the overall design is wonderfully striking and elegantly modern. If you’re looking for a more subtle kind of hanging egg chair that’s both easy on the eye and built to last, then the Island Bay hanging egg chair may be the model for you. 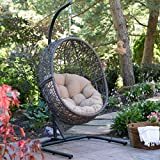 With a heavy-duty, powder-coated steel frame that’s wrapped in a resin wicker, this Island Bay Boho-chic-style hanging egg chair is the ideal accessory to add to your patio this summer. The Island Bay cheap hanging egg chair has a generous weight capacity of 300 pounds and is quite big in terms of size. Assembly isn’t awful but plan to work at it for about an hour before you’re done. While the Island Bay Kambree Egg Chair brings the style, in terms of comfort, it leaves something to be desired. The chair is big enough and sturdy enough for most needs. And the driftwood finish gives it a unique look that not many other hanging egg chairs possess. The price is in line with most others too. But, the raised edge of the chair is a little uncomfortable when sitting, and there’s no back support for the cushion as there is with the Art to Real model. The other issue is that the basket is quite wide and sometimes hits the support stand when swinging. The second Island Bay Hanging Egg Chair on our list, this detailed, interwoven espresso PE-wicker egg chair has a few significant points going for it. The wicker weave is tight and is quite eye-catching. The large cushion has a good deal of back support, which is a plus compared to the previous Island Bay egg chair we just examined. Here we have another beautiful, contemporary looking hanging egg chair on offer from Island Bay. With a durable steel frame that’s wrapped in an elegant espresso resin wicker, this chair will look great just about anywhere. The wicker weave on this one is beautiful, and while it is not as abstract as the Christopher Knight chair, the complex weave on this one provides a great deal of visual interest. Unlike some other hanging egg chairs on the market, this one is pretty easy to assemble. It’s also easy to clean. Simply wipe the frame with a damp cloth as and when needed and the cushion cover is easily removable and machine washable. In terms of looks, there’s nothing to grumble about. It’s elegant, it’s subtle, and will blend in with almost any surrounding. In terms of durability, it seems to be very well made and likely to last a while. 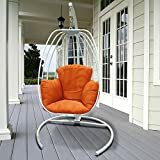 And in terms of comfort, while it may not have a back cushion like that of the Art to Real hanging egg chair, it is still extremely comfortable and once you’re in it, you won’t want to get out again. And for that reason, we’ve made it our runner-up cheap hanging egg chair. Great Deal Furniture’s entry into the Hanging Egg Chair product category is an interesting one. It’s a bit more of a banana-chair than an egg chair, but who’s counting? This chair takes the core of the egg chair design and removes the round outer support frame. It replaces that frame with two tighter curved side-supports that function well, and look really cool. If you’re looking for a hanging egg chair that stands out from the crowd, then this beautiful model on offer from Great Deal may be right up your street. Made from a weather-resistant PE wicker material, this chair’s minimalist design works well in almost any setting. Most hanging egg chairs take up quite a bit of space, which for many who live in small-yard, urban environments, is at a premium! Great Deal Furniture’s design cuts down on the space requirement significantly and brings this more toward the format of a hammock swing chair, but with a solid frame. 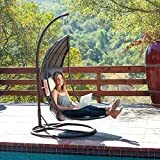 While many people prefer to have these kinds of chairs outside on their patio or next to the pool, this model is compact enough to have indoors too. The frame’s made from a sturdy powder-coated steel and weatherproof aluminum, so while it may not look very sturdy, it is pretty solid and likely to last for quite some time. While the Great Deal Furniture Brown Wicker Hanging Chair certainly looks the part, and it has a pretty solid construction. The problem is that it doesn’t quite live up to the same standards as it’s rivals. When comparing it against the Art to Real hanging egg chair, the first thing that lets it down is that it’s not that easy to assemble. And while all the tools you need to construct the chair are included in the package, the quality of them leaves a lot to be desired. It’s also not the most comfortable chair to sit in. The cushions are quite thin and sparse and, depending on your position, your legs may end up rubbing against the chair’s bottom lip. Conclusion: Hanging Egg Chairs, Cheap! Hanging egg chairs make a great addition to any patio, poolside, or room and as demonstrated above, they don’t have to cost a fortune either. For us, the best hanging egg chair around at the moment is, hands down, the Art to Real model. Not only does this chair look fabulous, but it is so comfortable to sit down and relax in. And, it’s a decent price too. But, if you’re not convinced by the beauty of the Art to Real hanging egg chair, then be sure to check out the Island Bay Espresso Resin Wicker model. It too is a beauty and is of solid construction too. It may be slightly less comfy than the Art to Real chair, but other than that it’s a great buy.